There's a different schemer or slimeball behind every door: cocaine duckpins who have survived only by the dumbest fortune, hard-luck gigolos desperate to score, undercover cops busting undercover cops who are running sting operations on undercover cops. And just down the row, local historian and spree killer Serge A. Storms -- who has stopped keeping up with his meds -- is still looking for a briefcase stuffed with five million dollars...and is now capable of wreaking more havoc than hurricane Rolando-berto, the big wind gathering force offshore, just waiting for the opportunity to blow everything straight to hell. If you're a lover of Tim Dorsey's manic Serge Storms series, it's probably enough to say that you won't be disappointed in this book. It's the second in the series, so you get to see the appearances of some characters that populate the later books, like the lovely ladies City and Country. Serge's sidekick Coleman has not yet been reincarnated (apparently killed in "Florida Roadkill" but there is a not-quite-so-stupid Coleman surrogate, Lenny Lipowicz. I believe this is the first appearance of the "Accidental Virgin" Johnny Vegas, a recurring character in the series. If you've never read a Serge Storms book, then I have a recommendation for you: don't read this one first. Not because you'd be reading them out of order, that's not too important. I recommend you start with one narrated by Oliver Wyman. Come back to George Wilson once you're firmly hooked. I've listened to a lot of George Wilson. I spent almost 24 hours with him in "Citizen Soldiers", and thought he was great in "With the Old Breed". What those two books, and many other Wilson narrations, have in common is they are factual narratives. Not too many ways to punch up the Battle of the Bulge. Serge Storms is a maniacal character. George Wilson's portrayal of this zany character is like Richard Nixon impersonating the watermelon-smashing comedian Gallagher. He just doesn't know how to be crazy. And don't get me started on Wilson's rendition of the various shrieks and yells that litter the text. Or how he "sings" the song lyrics that show up from time-to-time. Oliver Wyman, on the other hand, is the perfect characterization for Serge, Coleman, Lenny, and all the rest. He must know someone with some serious problems to capture them so well. And he surely has been a witness when someone hit a bong. So, start with a Wyman story, then maybe mix them up, Wyman, Wilson, Wyman, Wilson ... I believe they each did about the same number of Audible's productions, so it will even out in the end. By the way, if you're a fellow Floridian you'll recognize many of the places Serge describes in this series of books. When I was a kid we traveled all over the northeast part of the state, as that's where our relatives lived. Along the way we'd stop at Weeki Wachee Springs, the Alligator Farm, Saint Augustine, some old pirate bar whose name I forgot, and many, many more. They're all real, and Serge knows every detail of their histories. Some fun! I love these books in the narrator is very professional. I'm addicted to all of Tim Dorsey book. 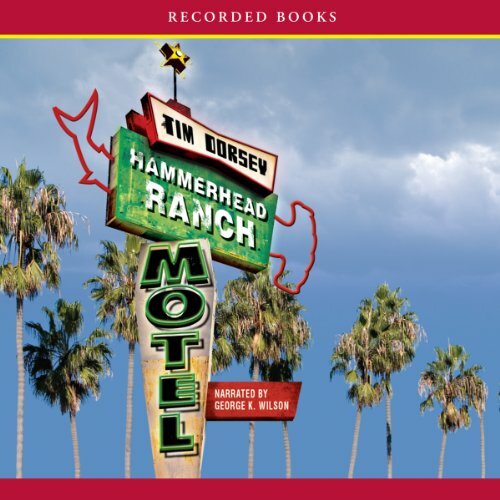 Where does Hammerhead Ranch Motel rank among all the audiobooks you’ve listened to so far? There actually was a plot, it was a little bit complex, and there were an awful lot of characters, but it all came together. It would be best to listen to this book alone, without interspersing it with other audio books so you can keep track of all the different characters. There are a lot as I said. No this is a good book you can listen to but their put down depending on your activity or drive. I actually listened to it in the house on earphones which is unusual for me. Parts of it were exciting and humorous enough to Keep me listening after I got out of the car. I love Serge. Give me more!!! Can't get enough of his humor and insights into our failed humanity. Too much fun! I gave a lackluster review to Florida Roadkill, but I went ahead and got Hammerhead Ranch. The story is better here; maybe its because I know Serge now or because the background set up in FR gave HRM a chance to grow. But, I'm hooked on Serge now and I know I'll keep downloading these books. They're not great literature, and there's no real point to the tales. No underlying message or social comment. Some of the character names are cringe-worthy puns. I like quirky books. I've listened to all of Christopher Moore's books. The spirit of this book reminded me of Moore. This book had one too many story lines and tried too hard to bring them together. Several of the characters were funny and I was interested to see what happened with them. But then others seemed to just be there for filler. I would try another Tim Dorsey book because this one was close to be really good. a very cool series of books. exciting, intense and funny. love this series of books. I love ALL of the Tim Dorsey books. Hammerhead Ranch Hotel is one of the funniest! What other book might you compare Hammerhead Ranch Motel to and why? Almost all of this series is as good or better! I love the opening sequences of the book. They set the tone for the rest of the adventure to come. If you could take any character from Hammerhead Ranch Motel out to dinner, who would it be and why? PLEASE MAKE A MOVIE ABOUT THIS SERIES!! a twisted tale told much like the film Pulp Fiction many charictors stories seem disjointed in the beginning but the more you listen the more you understand. it can be difficult to follow if your mind wonders, which might be my biggest problem. never the less i did find it enjoyable the perfect blend of comedy action and a twist of who done it.